Our Printed Safety Vests are designed to meet or exceed AS/NZ Standards, with tough, high quality materials, and manufactured to order right here in Australia and with our super fast shipping, we will have your safety vest delivered straight to your door before you know it. 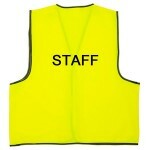 We also have available a range of EMBROIDERED CAPS that compliment our Printed Safety Vests. Purchase both at the same time for a complete look and combine them into a single order so you save on shipping. 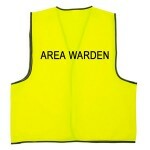 Area Warden Printed Vest Designed in light weight polyester so you'll stay cool and comfortable, the safety vest comes pre-printed with the text AREA WARDEN on the back in solid black lettering. 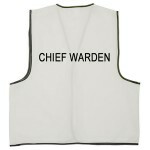 Av..
Chief Warden Printed Vest Designed in light weight polyester so you'll stay cool and comfortable, the safety vest comes pre-printed with the text CHIEF WARDEN on the back in solid black lettering. .. 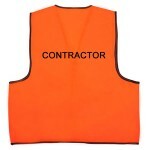 Contractor Printed Vest Designed in light weight polyester so you'll stay cool and comfortable, the safety vest comes pre-printed with the text CONTRACTOR on the back in solid black lettering. 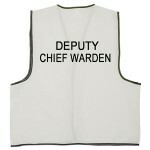 Avai..
Deputy Chief Warden Printed Vest Designed in light weight polyester so you'll stay cool and comfortable, the safety vest comes pre-printed with the text DEPUTY CHIEF WARDEN on the back in solid blac.. 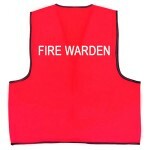 Printed Fire Warden Vest Designed in light weight polyester so you'll stay cool and comfortable, these fire warden safety vests comes pre-printed with the text FIRE WARDEN on the back in solid black..
First Aid Printed Vest Manufacturing safety vests since 1990, Green Triangle Distributors are experts at producing and sourcing first aid vests for different requirements. Designed in light weight .. 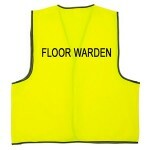 Floor Warden Printed Vest Designed in light weight polyester so you'll stay cool and comfortable, the safety vest comes pre-printed with the text FLOOR WARDEN on the back in solid black lettering. .. 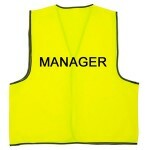 Manager Printed Vest Designed in light weight polyester so you'll stay cool and comfortable, the safety vest comes pre-printed with the text MANAGER on the back in solid black lettering. 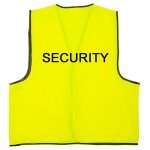 Available ..
Security Printed Vest Designed in light weight polyester so you'll stay cool and comfortable, the safety vest comes pre-printed with the text SECURITY on the back in solid black lettering. 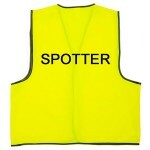 Availabl..
Spotter Printed Vest Designed in light weight polyester so you'll stay cool and comfortable, the safety vest comes pre-printed with the text SPOTTER on the back in solid black lettering. 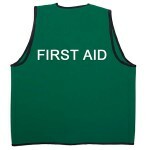 Available ..
Staff Printed Vest Designed in light weight polyester so you'll stay cool and comfortable, the safety vest comes pre-printed with the text STAFF on the back in solid black lettering. 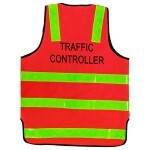 Available in f..
Vic Roads Traffic Controller Printed Vest Designed in light weight polyester so you'll stay cool and comfortable, the safety vest comes pre-printed with the text VIC ROADS TRAFFIC CONTROLLER on the .. 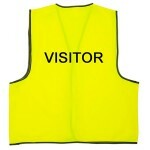 Visitor Printed Vest Designed in light weight polyester so you'll stay cool and comfortable, the safety vest comes pre-printed with the text VISITOR on the back in solid black lettering. Available .. 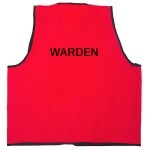 Warden Printed Vest Designed in light weight polyester so you'll stay cool and comfortable, the safety vest comes pre-printed with the text WARDEN on the back in solid black lettering. Available in..